I am constantly amazed by what we can do with our needles and yarn! Last week we got in some new yarns, not an unusual happening at any yarn store, but I was particularly impressed with both of these yarns. Grande Hat – Check out the Colours! luscious colours, came with advertising – One Ball, One Hour, One Hat and included 4 hat patterns. I decided to test the advertising. I took a ball, the pattern and some needles home to knit the hat. The next morning I put the kettle on and sat down to knit. In the next hour I made tea, saw my husband off to work, drank 2 cups of tea and knit the hat! It took 1 and 1/4, leisurely hours to start, knit and finish the project – Truth in Advertising! Need a quick gift, this might be just the item. A little time, some needles, yarn and the metamorphosis begins. Molten Metal – Silken Mesh – Pattern under construction. OK – you may need a towel to wipe the drool off of your computer screen. This next yarn truly showcases what makes a yarn so special. Silken Straw by Alchemy of Yarns is one of those special silks that shows why mankind has been so fascinated by that particular fiber for so long – a thousand plus years! 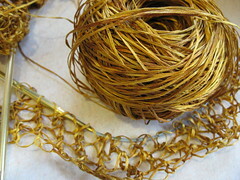 Silken Straw is hand-dyed and spun with some of the “Glue” that holds the silk pupae together. 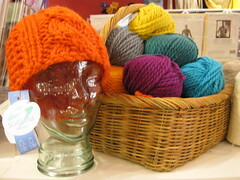 The colours are intense and the yarn has incredible eye appeal. At first touch the yarn feels like “straw”, as it is worked it gets softer and softer until, when it is finally finished with steam and a light pressing, it blooms to its full potential! A fluid marvel that invites touching and is infinitely pleasing to the hand and eye – Metamorphosis indeed. We received 10 colours and 3 of the Destination Alchemy Books, come in and check them out! Silken Straw – Drool Optional! » Uncategorized » Metamorphosis – Yarn Magic!